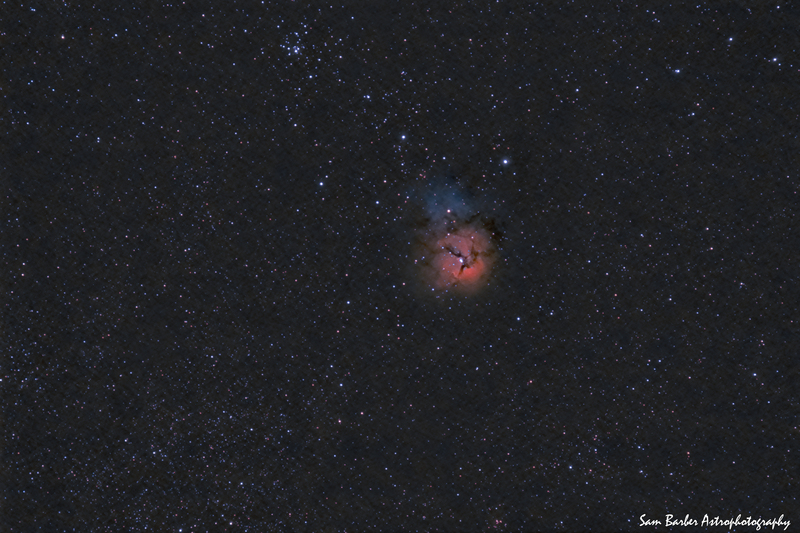 The Trifid nebula is a very interesting combination of three types of nebulae. Discovered by Charles Messier in 1764, M 20 is a dark nebula (the dark filaments in front of the nebula), an emission nebula (the red gas in the lower lobe), and a reflection nebula (the blue portion, shining from the light of the surrounding stars). The open cluster above the nebula is M 21, and the red cluster on the lower border is Bochum 14, a magnitude 9.3 open cluster. The large collection of stars to the lower left is a hole showing to the center of the milky way. I tried to mosaic the lagoon and trifid, but my focal length was just too long and unwieldy for such a task. But, now I get double the processing fun!